You can have your Black Friday and Cyber Monday. Everyone knows the holiday shopping season doesn't really kick into high gear until the annual appearance of the Uni Watch Holiday Gift Guide, your best source for gift items related to the visual culture of sports. The ground rules are the same as in the past: If you're looking for your basic jerseys and caps, you won't find those here (you already know where to find those). But if you're searching for unusual products relating to uniforms, team logos, sports equipment or any other area of athletics aesthetics, you've come to the right place. This year's haul features items from a wide range of sports and price points, so there should be something for everyone. Ready? Here we go. Sure, you could just put your bobblehead collection on shelves like everyone else. But why do that when your bobbleheads can live in their own dugout, or bullpen, or penalty box, or grandstand? All that and more is available from BobbleHouse Industries, which creates sports-themed environments that are sized just right for bobblehead dolls. If you don't like any of their stock items, they'll custom-design something for you. A great way to enhance your collection. Check them out here. Got a spare $1,620 burning a hole in your pocket? That's how much it'll run you to score one of the new NBA cashmere sweaters from the luxury brand Elder Statesman. If you can't afford that, you can always get a cashmere hoodie for $1,200, a cashmere scarf for $725 or a cashmere pompom cap for $420. Sure, the prices are ridiculous, but it's still pretty amusing to see classic NBA designs like the Lakers' chest lettering rendered in cashmere. (Ditto for not-so-classic designs like the Clippers' current logo.) Unfortunately, they don't have a cashmere version of the Hawks' neon-green graphics -- maybe next year. Additional info here, and you can check out the full product line here. Ya say ya want more than just Cardinals uniforms? This new volume from Smithsonian Books charts the course of baseball history through the uniforms worn by the game's biggest stars. The early chapters highlight the jerseys worn by legends like Babe Ruth, Ty Cobb and Bob Feller, while later chapters focus on the expansion era, the move to double-knit uniforms and the modern era (you can see some of the book's interior pages here). Spectacular photography showcases the feel of each uniform, from the textured flannel of Jackie Robinson's Brooklyn Dodgers jersey to the deep powder blue of George Brett's Royals road uni. A treat for any uniform fan. Get it here. Show your team pride, and make the neighbors jealous while you're at it, with these lawn stencil kits from the appropriately named Great Big Logo company. The kits are available for a range of college teams, and each one comes with the appropriate paint colors for the job. Get them here. Let's face it: Most baseball bats are pretty plain-looking objects. But if you start painting stripes and patterns on them, they're transformed into surprisingly cool display pieces. Two companies excel at this: Mitchell Bat Company, which specializes in vibrant stripes (check them out here), and Pillbox Bat Co., which adorns its product line with very handsome flag-based imagery (check them out here). The only problem is that you'll never find a stocking long enough to stuff the bats into! You might think all shoelaces are pretty much the same. But any serious hockey fan can pick out real skate laces, which have diagonal ticking stripes running through the cloth. Now you can get a Lace Case -- an iPhone case made with real skate laces. It's an ingeniously simple and visually effective way to tell the world which sport is your favorite. Get it here. Put your money where your uni is -- or maybe it's the other way around -- with these genuine leather wallets lined with swatches from authenticated game-used jerseys. Available in a wide range of NFL, MLB, NCAA and NHL teams. Get them here. If you're a sucker for the design of vintage program covers, old-school ticket stubs and other sports graphics from yesteryear, you'll love Moonlight Wraps, which produces professional-looking canvas reproductions of classic sports designs and illustrations. The pieces are ready to be hung on the wall, and the prices are surprisingly reasonable. Check them out here. If you or someone on your shopping list is a fan of Roberto Clemente or Jackie Robinson -- and really, who isn't? -- you'll like these retro T-shirts. Granted, the $39.95 price tag is pretty steep, but come on, it's the holidays. Jackets and caps are also available. Check out the full product line here. • If there's a Dallas Cowboys fan on your shopping list, maybe he'd enjoy this selection of Cowboys underwear. • This print of an old patent drawing for a baseball would look nifty on someone's wall. • These NFL and college football blankets look good and will keep you toasty this winter. • Menswear accessory maker Josh Bach makes some interesting baseball-themed neckties featuring pitchers' grips, demolished stadiums and field patterns. • Do you want your favorite team's logo on a dartboard cabinet? Sure you do! • Cycling fans will want to check out this new book about cycling jerseys. • These NHL adult onesies are endearingly absurd. • Old-school video gamers will love these Tecmo Bowl T-shirts. • Your go-to source for throwback college football helmets is still Gridiron Memories. You can still get beautiful illustrations of old-timey baseball stadiums from Jeff Suntala. And your best bet for spectacular one-of-a-kind painted baseball gloves is still artist Sean Kane. Paul Lukas knows who's been naughty and who's been nice, but he's not telling. If you like this column, you'll probably like his Uni Watch Blog, plus you can follow him on Twitter and Facebook. 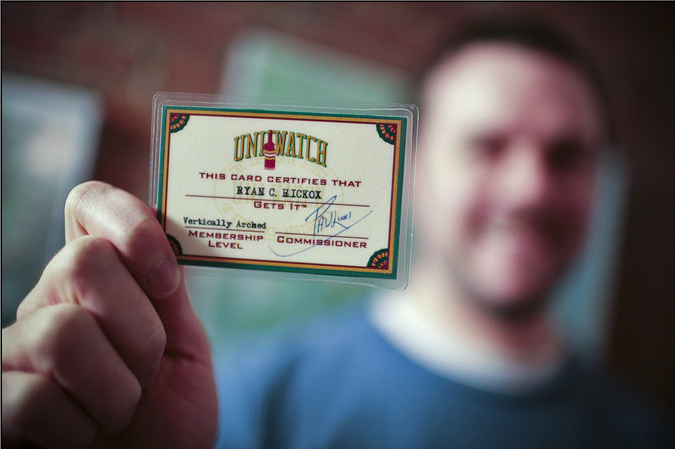 Want to learn about his Uni Watch Membership Program? Sign up for his mailing list so you'll always know when a new column has been posted or to just ask him a question. Contact him here.